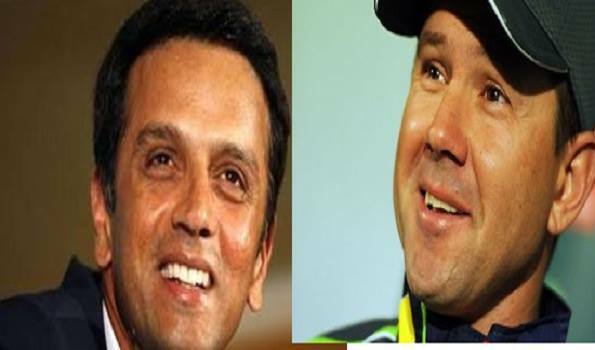 Dubai: The International Cricket Council on Sunday inducted former Indian captain Rahul Dravid, former Australian captain Ricky Ponting and retired England Women wicketkeeper-batter Claire Taylor into the ICC Cricket Hall of Fame during a glittering ceremony held in Dublin, Ireland. Rahul Dravid became only the fifth player from India to be named in the ICC Cricket Hall of Fame while Ponting is the 25th from Australia to do so. Taylor is the seventh woman overall and the third female player from England to be named in the list. "It is a matter of great honour to be named by the ICC in the Cricket Hall of Fame. To find your name in a list of all-time greats across generations is something one only dreams of while setting out on a cricket career and the kind of recognition that would delight any player'', said Rahul Dravid. "I'm thankful to my near and dear ones as well as players I have played with and against, coaches and officials who have backed me over the years and helped me develop as a cricketer. I would also like to thank the KSCA and the BCCI for all the support over the years and the ICC for recognizing my achievements and picking me in this group of Hall of Fame inductees'', he added. Ponting, who as a captain led Australia to World Cup victories in 2003 and 2007 said. "I feel deeply honoured to be recognised by the ICC in this way. I loved every moment of my journey as a player and am so very proud of the team and personal achievements along the way''. "These would not have been possible without the help of so many people including my teammates, coaches and support staff that played such an integral part in my playing career. I would like to especially thank my family for their constant support and direction. Honours like this are just as much for them as it is for me", he added. Meanwwile, Claire Taylor said, "It's a great honour to be inducted into the ICC Hall of Fame alongside some of the greatest names of the men's and women's game from across the world and throughout the generations, players who I looked up to during my playing career and hold in great esteem.